We are going to a party and Zorra of 1 x umrühren aka kochtopf ask us to bring some bread. Not any bread but special bread with Beer to celebrate the 5th anniversary of Bread Baking Day. Cheers Zorra, on the next 5 years! 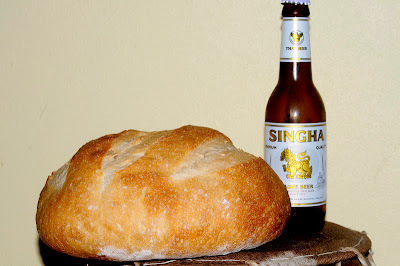 I’ve used beer in bread before.It reacts different from water; it makes the dough softer and smoother. The crust gets more color because of the sugar in the beer. We choose Singha, brewed in Thailand, a 6% pale lager. The Singha is a mystical lion, found in ancient Hindu and Thai stories. It is a powerful mythological creature and was chosen as a symbol. I wanted a basic recipe, just made up with the baker’s formula. When you use the bread baker’s formula, can you call this your ‘own’ recipe? I thought; ‘what’s my own recipe?’ There is no ‘own’ recipe. I read on the Internet: a recipe is not copyrightable -- though the description of how to cook the recipe could be. The list of ingredients, however, is factual. When I started to bake bread, more than a year ago, I loved all those blogs on baking bread. All those people sharing their experiences, their failures and victories. Giving advice and showing what they learned so far. When I e-mailed some of those artisan bakers, they gave me answers on all the questions I had. And there were many questions because in the beginning I had no idea. Most people love to show their artisan breads and share their recipes too. Thanks to those people I’m able to bake so many different breads. I don’t own many books on baking bread. Off course I would love to have some books and learn from the masters. Like Jeffrey Hamelman, Dan Lepard, Bourke Street Bakers, Tartine, and … That would have quickened my victories on baking bread. But, I choose the long way and made a lot of mistakes. I’ve learned so much. I love to share the recipes I found and baked so far. I think the world will be a nicer place when we all share more of what we have instead of fight to protect of what we think is ours. What is mine? What is yours? Everything you know or do, has been given to you by others; your parents, your teachers, your family, your friends, your enemies, your children, your ….. Even your parents and teachers had parents and teachers and their parents had parents and teachers too. In fact, everybody is a teacher for you. So, what is really yours? What is really mine? But, today we celebrate. I share this bread with you all. For this 5th anniversary Bread Baking Day celebration I use a basic recipe and I used the bread baker’s formula; 100% white flour, 15% sourdough at 100% hydration, 2% salt and 61-66 % beer. The hydration of the loaf is 61% without sourdough en 66% included sourdough. This time I didn’t want to use any rye, wheat, flax or other seeds, no nuts, no fruit. No extra ingredients to distract from the taste of basic bread with beer. And what a good thought that was. As you all know there is no alcohol left in the bread, but with beer something different happens with the dough. As soon as I started to mix the dough it was softer and smoother then when water is used. It's delicious bread, the crumb is very soft and the crust is thin. Even thought I love a thick crust, this is a perfect soft bread. It definitely asks for fresh strawberries or a Dutch raw salted herring. Both are not available here right now, but our home made strawberry jam and the goat cheese we brought back from the Netherlands were also delicious. This is a real celebration bread! Add the salt and continue mixing on low or medium speed until the dough reaches a medium level of gluten development. It's very smooth. Transfer the dough to an oiled container. Ferment at room temperature for 2.5 hours. I gave it a stretch and fold at 50 and 100 minutes. This helped to give the dough more strength. Turn the dough out onto a lightly floured counter. Divide it into two 400g pieces. Pre-shape the dough into a light ball. Sprinkle the ball lightly with flour, cover loosely with plastic, and let rest for 15 minutes. Shape into a tight ball and place on a floured couche. I placed a moist towel on the ball and proofed at room temperature for 2 – 2,5 hours. Meanwhile, preheat the oven, with baking stone and baking pan with hot stones, to 250° C.
Turn the proofed loaf onto parchment on a peel. Slash with three cuts. I baked the loaf for 12 minutes with steam, and another 25 minutes without steam. The crust should have a nice brown color. Then turn off the oven and leave the loaves in for 5 minutes longer, with the door ajar, to help them dry. I send this celebration bread to Zorra, inventor and host of Bread Baking Day. Go and see all wonderful loaves to get inspired. And don’t forget to join next month! I send this to Susan’s YeastSpotting, a great showcase of artisan bread. and don’t forget to visit and join Heather of Bake Your Own Bread. Heather collects all kind of breads, yeasted or not, and other treats to show and share. Gorgeous! Yeasted beer breads are always some of my favorites. I love "your" version. And darn-it-all that I forgot to check the BBD theme this month! I still have a few days, though so maybe I'll get something made for it! Thank you for your thoughs about what is mine and what is yours. I am with you. And a big thank you for joining the party. Love your loaf! I just mixed up my beer dough. I'm using my own basic bread recipe which I adapted from The Laurel Kitchen Bread Book. It's her Basic Whole Wheat Bread on pg.80. I adapted her recipe to sourdough and made some other changes. You can no longer find her basic bread recipe within my recipe. So its truly a signature true blue recipe. I added 2 bottles of beer and I used grains and nuts because grains compliment beer and so do nuts. I'm making 3 loaves. I also added oil, and honey, and home milled hard white wheat, oats/barley flake flours (home milled) rye, and organic popcorn flour, and high protein bread flour. I wanted to make a soft sandwich bread. I tasted the dough and its delicious. Will take pictures once I bake up the loaves.